Basically, you can take an order for a Custom Tipsheet in the same way you'd take a meal order! In fact, one way to do this easily would be to offer a FREE CUSTOM Tipsheet with a meal to introduce the concept to the players. But, you might also simply have an order counter available for this purpose. Once you get familiar with the simple process and choices available when creating a custom tipsheet, you can produce an "order form" for a custom tipsheet. Customers simply fill out the form, then make payment, and wait for their order to be served up! Once you've gotten the order, its time to use "QTRetail" along with your WINDOWS 98/ME/2000/XP computer along with, hopefully, a fast laser printer. These days, this hardware can cost under $500, and you probably already have it! 1) Use of QTRetail requires INTERNET ACCESS. You'll see why shortly as we explain more of the process. 2) This connection will work satisfactorily with a simple dial up connection. No HIGH SPEED expensive connection is required. Step 1 - Enter the name of your business. Example "BOB'S Grill and Bet", then PRESS THE ENTER KEY to enter the name and go to the next step. Step 2 - Enter any combination of letters or numbers which are easy for you to remember. In our example, we'll enter "123456". You can enter up to 6 number/letters. Do not use SPACES. And, PRESS THE ENTER KEY to enter the PASSWORD and go to the next step. Step 3 - VERY IMPORTANT! This is your email address. We will use it to keep in contact with you regarding updates and your subscription. It identifies YOU individually if the other two fields are actually used by some other business. In our sample, notice we've entered "bob@handicap.com. PRESS THE ENTER KEY one last time, and the following display will appear. Remember Step 2 - see above - where you entered a password that was EASY for you to remember? Well, now enter that password again. Then PRESS THE ENTER KEY. Ours was "123456". Hopefully, all has gone well, and "QTRetail" will automatically access all our current tipsheets for today from our internet server. QTRetail does this once a day, and the entire process can take several minutes or even longer, depending on how fast your internet connection is. It is totally automatic, so simply go about your business while this process completes. Once this daily download is completed, then your sales process will take just seconds for each tipsheet. After downloading the tipsheets, QTRetail will display a status of the tipsheets downloaded, which indicate what wagers are available. The "wagers available" is explained later, and we are in the process of adding more. This is our license page and will appear every time you startup QTRetail. Read it, and if it makes sense and you agree to be bound by it, press your Left Mouse Button after making sure the CURSOR is over the "I AGREE" box. If you do not wish to go further, then click on the X (exit) button in the top right corner of the window, or press the Right Mouse Button. QTRetail automatically creates a "CUSTOMER ID". This ID will be printed on the Custom Tipsheet when it is printed. If you find that you have a customer that always wants the same type of tipsheet, you can CREATE a Customer ID for that customer. Ask for his name, or something else he can easily remember next time (like phone number or first initial, last name). Type this information into this field and PRESS THE ENTER KEY. You DO NOT have to type spaces over characters that are already in the field. You will notice, the next time this customer returns (tomorrow hopefully), that, when you type in this ID, his information will come up immediately. This will save you time and your customer time. From this display on, there is NO MORE KEYBOARDING. All features are operated by using the Left Mouse Button or the Right Mouse Button. After selecting "I AGREE", you are now ready to create your first CUSTOM Tipsheet. 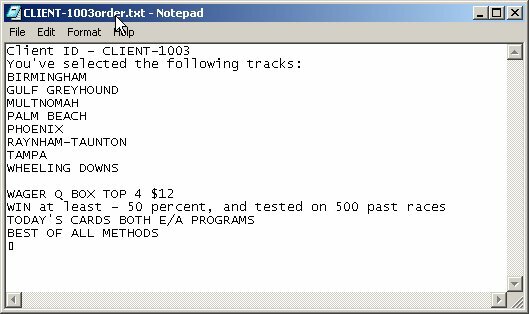 Now that we've entered a CUSTOMER ID or left the default "CLIENT-1002" (as shown above), the next step is to highlight those tracks the customer wants to play. These may be the tracks available for viewing at your business or, the customer may simply want to return home to play on the internet. Whatever his reasons, you can provide him with the information for these tracks that we cover. Simply use the Left Mouse Button and click on any tracks your customer wishes to handicap. These track names shall then change color to YELLOW. Click on a track again, and it is de-selected and changes color to WHITE. Use the PAGE BACK and NEXT PAGE "buttons" as required to find all the tracks your customer wishes to play. To finish the selections to create your customer's custom tipsheet, you can select the wager type, the success of the method, and the number of races tested to show this success. Also, you can produce the RESULTS of "2 DAY OLD" race cards to show how well the tipsheet performed in the past. (Note: We provide 2 DAY OLD tipsheets because tracks are sometimes slow to get the results posted immediately following the evening events). Of much more interest to your customer, however, is that you can produce TODAY'S TIPSHEET. We've created several types of wagers and backtested the success of our Tipsheet system over a number of races in the past. For example, as shown above, the "COLD WIN" wager. We tested our 5 methods of handicapping for hundreds of back races to show its fitness for each individual track at each grade and distance run on that track. As an example, our "Morgan Method" tested for the % success of predicting the Winner for a grade A race at 5/16 of a mile at Gulf Greyhound Park might have predicted 40% winners over 500 races recently tested. But we've also tested this method for % Win percentage of a Box Exacta involving a Method's Top 4 dogs. The method used to pick the top 4 dogs to box in an exacta is different than the one used to pick the COLD WIN. This is the difference between our tipsheets and what other tipsheets offer your customers. Depending on the type of WAGER we've tweaked our Methods to produce the highest possible wager WIN %! So, the first thing the customer must do is decide on his wager. The different wagers we've tested will popup when you select this Wager Button. We want to have available as many wagers as possible, so please let us know what your customers are interested in. Our computers will produce methods for these types of wagers, and use the internet to deliver that information to you when it is available. Next, the customer can specify his level of comfort in the types of races he wishes to play. For example, a race run at Gulf might be predicable in the 40% range for the 1234 Box Exacta, according to our backtesting, but your customer might not want to wager unless the Success % is 50% or more. So, the tipsheet produced would only show the customer those races where the method produced winners of the wager 50% or more of the time. Obviously this allows the customer to spend time on these races and skip others without temptation. Just like Win %, the customer can select a level of comfort with the number of races tested. He might wish to specify 100 races or even 500 races to have been tested with the method before he will trust it enough (no matter what the percentage of success) to bet it! Finally, your customer may want to see the results of such a tipsheet for the past day or so. Or he may be ready to play a tipsheet for today. And, obviously the customer will want to play a particular method (if he's had success with that method), or simply have a tipsheet which picks the best of our 5 methods, according to percentage win and number of races, for each race and goes with that method. Just continue to click on the Method Button until the selection desired appears. Your customer walks away having paid for this tipsheet, yet pretty comfortable that very few other customers have this same information. Why? Because he's customized it! For this example, we've selected both Evening/Matinee Performance, today, and the intended wager is Q Box 4, and the method has been successful 50% of the time over 500 recent races at that grade/distance. Furthermore, look at each method, but give the method that has been best at predicting this type of race. We're now ready to verify this information with the customer if he's standing there...Select CREATE TIPSHEET. A verification popup will show just what tracks, wager type, etc., that the customer has ordered. You can read this back to him, and accept payment for the tipsheet to be produced. 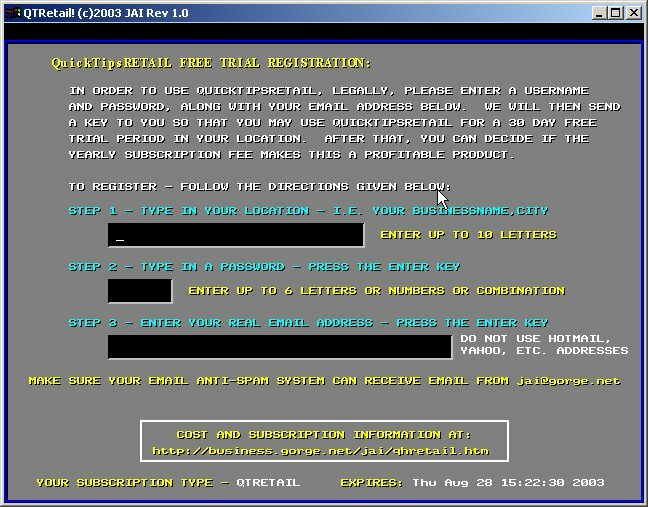 Within a few seconds of this popup, you will notice that QTRetail is READY to PRINT or write the tipsheet requested to a diskette. YES! Some users may have a laptop with them! We're trying to think of all of your customers! This popup allows you to choose to provide the tipsheet on diskette, or paper, or to cancel the Tipsheet process entirely. To write to diskette, simply place your diskette into the A drive, and click the DISKETTE button. To CANCEL, select CANCEL. Otherwise select the PRINT button and continue with the popup below. Many of today's new computers use the USB port, a thin cable which connects your computer to the printer via a USB Port. If this is your connection, click on USB, otherwise select the computer Port that connects your computer to your printer. LPT1 is very common and, if unsure, try that Port first. 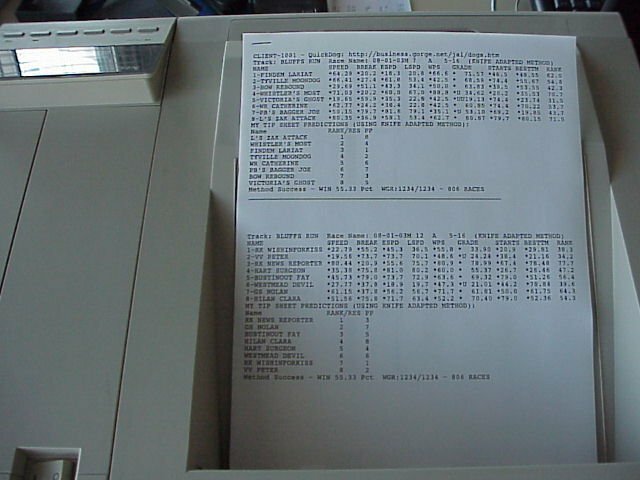 The printer output should include 4 races per page. If this is not happening, make default adjustments to your printer until this does occur. Click HERE for to see a sample CUSTOM TIPSHEET file. Note the selections are based on time of day (times are based on YOUR LOCATION - this one was printed by a vendor on the west coast) and sorted in order according to the anticipated POST TIME for the actual race. All the user has to do is follow along to plan out his or her day at the simulcast facility or even at home on the personal computer wagering at US OFF TRACK or similar online wagering facility. Since this is a new product, we're interested in being able to test market it to your customers. We'll provide this test market capability for up to 2 months. After you've had a chance to learn to use the software (its registered to you for 7 days initially), we'll provide a FREE 30 day subscription to you to use as you wish (you're confident you can use the software). You might want to price the tipsheet as follows - $2 per track selected, minimum $4, but all tracks will be provided for $10 or $15 or whatever your market allows based on interest. An initially FREE trial to players when they buy a sandwich, might be a good introductory offer. Our subscription price, after the free period, will be $30 monthly initially and will be adjusted based on your traffic at your location, but will not exceed $80 monthly. Basically what we'll look for is a base of $30 plus 50 cents per TIPSHEET sold at your facility up to 100 tipsheets per month. What this means is, that after the first 100 tipsheets, 4 per day, you are making pure profit. Ready to Download and Learn how to use QTRetail? Just CLICK HERE! Then OPEN the link and QTRetail will install on your Windows 98/ME/2000/XP computer. Click Below for a textual description of what each of the data items means for a particular handicapping method. The data described appears on your customer's tipsheet depending on what method he has selected, or which method is BEST if he selects "BEST METHOD". This information should be posted at your location.